GitHub - conformal/spectrwm: A small dynamic tiling window manager for X11. 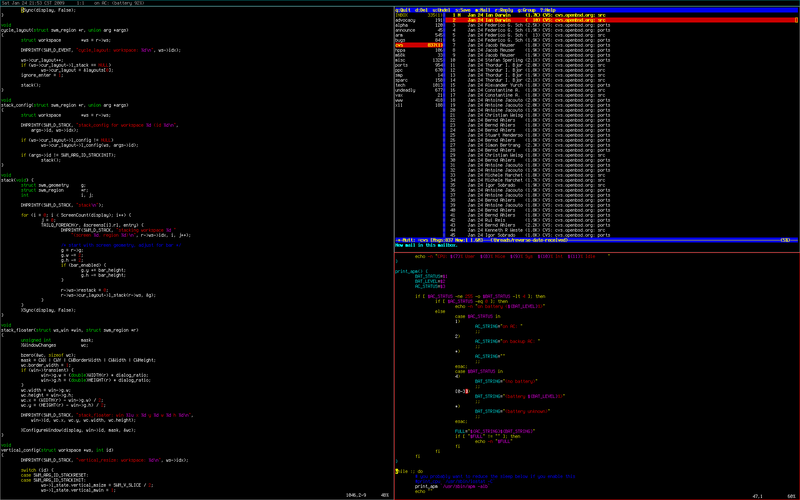 A small dynamic tiling window manager for X11. Want to be notified of new releases in conformal/spectrwm? LordReg and marcopeereboom [travis] Fix build failure. Ubuntu Xenial is missing libxcb-xinput-dev. For now, disable xinput support when build testing. 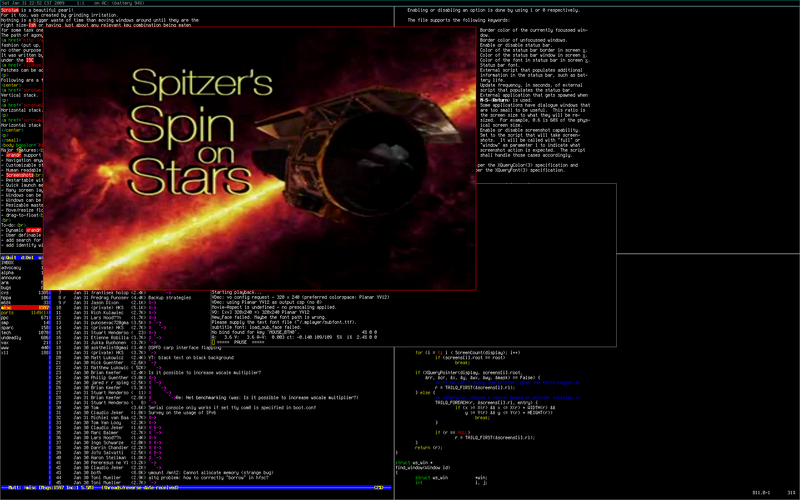 spectrwm is a small dynamic tiling and reparenting window manager for X11. It tries to stay out of the way so that valuable screen real estate can be used for much more important stuff. It has sane defaults and does not require one to learn a language to do any configuration. It is written by hackers for hackers and it strives to be small, compact and fast. 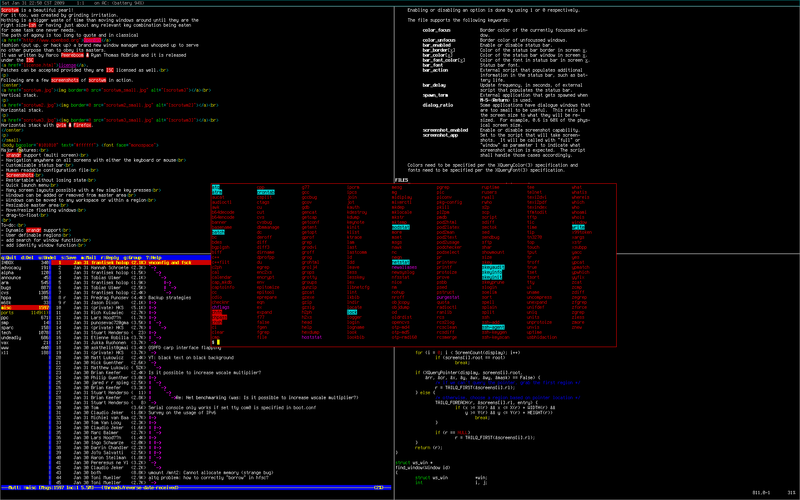 It was largely inspired by xmonad and dwm. Both are fine products but suffer from things like: crazy-unportable-language-syndrome, silly defaults, asymmetrical window layout, "how hard can it be?" and good old NIH. Nevertheless dwm was a phenomenal resource and many good ideas and code was borrowed from it. On the other hand xmonad has great defaults, key bindings and xinerama support but is crippled by not being written in C.
spectrwm is a beautiful pearl! For it too, was created by grinding irritation. Nothing is a bigger waste of time than moving windows around until they are the right size-ish or having just about any relevant key combination being eaten for some task one never needs. 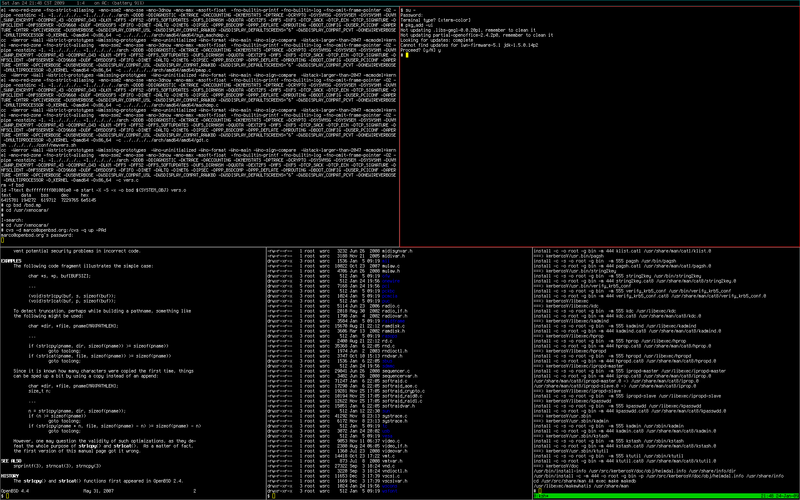 The path of agony is too long to quote and in classical OpenBSD fashion (put up, or hack up) a brand new window manager was whooped up to serve no other purpose than to obey its masters. It is released under the ISC license. Patches can be accepted provided they are ISC licensed as well. You can and come chat with us on IRC. We use OFTC channel #spectrwm. Adjustable tile gap allows for a true one pixel border. Customizable colors and border width. spectrwm is ISC licensed unless otherwise specified in individual files.